i’ve been playing around with farro lately, since it’s such a nice alternative to rice. i think it does particularly well as the bulk of a more pilaf-type salad, with fruit, nuts and greens all cut to similar sizes. i pulled this selection of seasonal flavors for a hearty late-fall farro salad. cook the farro in 2 cups of salted water until water boils away and farro is al dente. cut apart the pomegranate and collect all the seeds. chop apples, collecting pieces in a bowl, and sprinkle with lime juice. place the farro in a large mixing bowl. add the mashed garlic cloves and oil, parsley, almonds, arugula, lemon zest and parmesan cheese and mix well to incorporate. 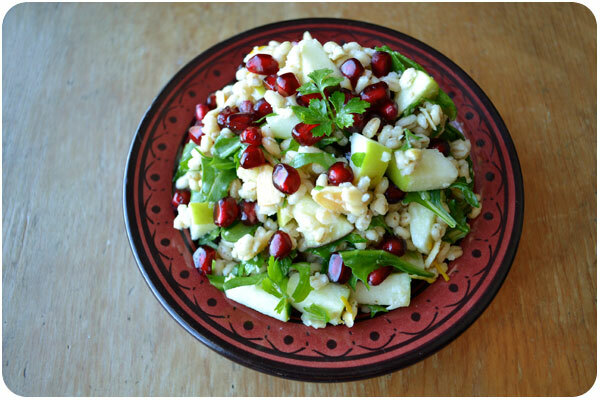 fold in the apples and pomegranate arils and mix gently to incorporate. salt and pepper to taste. serve warm or chilled. < hp+gp holiday special — one week only!